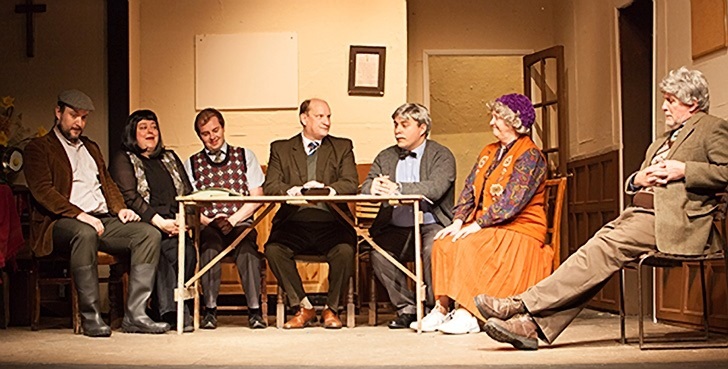 Owen, Geraldine, Hugo, David, Frank, Letitia and Jim - the Dibley Parish Council. Pictures: Roy Palmer. IT’S nine years since Geraldine Grainger last graced our screens as the vicar of Dibley, give or take a couple of short charity specials since, but in this splendid staging at Hall Green it is as if she has never been away. I must admit I am not a fan of stage versions of sitcoms. For a start, audience expectations are sky high and everyone already has an all too accurate picture of what each character looks and sounds like. So, unless the original cast is employed, too often stage versions of sitcoms end up as a sort of theatrical karaoke but here the cast have managed the remarkable feat of making familiar and much loved characters not only remain familiar but have added an extra facet by putting their own stamp upon them. You quickly forget that Ros Davies, for example, is not Dawn French; she might look like her and even sound like her but she becomes her own Geraldine in a very funny and polished performance. Similarly James Weetman is the colon challenged Owen Newitt, the farmer with some unsavoury and, we suspect, unnatural habits, with some lovely timing and deadpan delivery of some outlandish asides. His lustful attack on Geraldine is a comic gem, as is his return of her filling – revulsion and laughs all at the same time. He plays the character in the same way as the late Roger Lloyd-Pack, not trying to do an impression of him playing Owen. The difference is subtle but important, playing a character in a certai n way rather than playing Lloyd-Pack playing the character. Each member of the cast manages that distinction so we warm to their characters as they create them,such as in the way Paul Holtom becomes no, no, no, no, no, no, no, no, no, no, yes Jim Trott, capturing the character beautifully. Lin Neale provides the catering as Mrs Letitia Cropley, with food combinations that make Heston Blumenthal look positively boring – who could resist ham and cheese sandwiches with the added ingredient of lemon curd or plain pancakes with just a hint of liver. While Daniel Robert Beaton is Frank Pickle, as boring and pedantic as ever, taking copious minutes including minuting the fact he is taking minutes. And leading the parish council as its chair is David Horton, pompous, bullying, chauvinistic and played with suitable lack of humour and tact by Jon Richardson. Which brings us to our lovebirds whose combined IQs would struggle to reach three figures – indeed double figures would be a close run thing. Hugo, played beautifully by Matt Ludlam, is probably worth a grant of some sort for turning dim into an art form. He’s a gentle soul who lopes through life like a lovable puppy. We discover also that he has eclectic tastes in his sexual fantasies, which cost him a few bob with some lovely gentle comedy in Lent, ranging through Kylie Minogue to Edwina Currie, Anne Robinson and Anne Widdecombe? . . . and of course Alice. The boy really does need a love interest and he is made for Alice, the verger, who is one of nature’s less gifted intellectuals – if she took a lunch hour she would probably need retraining when she came back. Rachael Louise Pickard has often threate ned in past productions with some impressive performances, but this time she has really nailed it with her finest performance to date, she is just magic as the scatterbrain Alice, pretty, funny, excitable and at the same time oh so vulnerable. You just want to put your arms around her and protect her from the real world. A superb piece of comic acting. Alice and Hugo are a match made in heaven and their first kiss is something to behold . . . and behold . . . and behold . . . I suspect without it the whole thing could have been reduced to one act and we could have been home before it went dark. How did they manage to breathe I wonder? Writers Ian Gower and Paul Carpenter have avoided the trap of just a rehash of TV episodes and have written a play based on the original scripts by Richard Curtis and Paul Mayhew-Archer, opening with Geraldine arriving as the new vicar, a woman no less, “a babe with a bob cut and a magnificent bosom” much to David’s dismay and annoyance and all leading up to the wedding of Hugo and Alice. 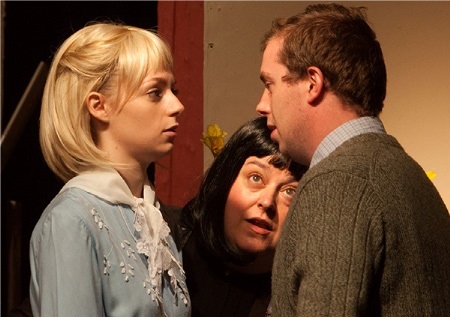 And in between are plenty of laughs from this fine cast who display immaculate comic timing. Not a weak character among them. Julia Roden has designed a clever set which creates three stages in one with the parish hall meeting room, Geraldine’s vicarage sitting room and the church office where Geraldine manfully tries to tell jokes to the oh so dim Alice, all separated by Paul Hartop’s lighting. Director Jean Wilde has found a nice gentle pace and, more important, has managed to create a production with all the characters we know yet has given them a life of their own so that we don’t constantly compare them to their TV personas. This is a proper play not an impressions show. Whether you have seen The Vicar of Dibley on TV or not, matters not a jot. This is a very funny play, with strong characters, which stands on its own two feet, or cow pat splattered wellies in Owen’s case. A wonderfully entertaining evening among old friends. To 10-09-16. Despite running from 15 December 1994 to 1 January 2007, there were only 20 episodes of The Vicar of Dibley produced, including Christmas and New Year specials with a further six short charity shows.